Reducing flanges are designed for when there is a change in the pipe size. The predominate flange (dimensions) matching the larger pipe size (NPT) but having a smaller bore matching the smaller pipe size (NPT). 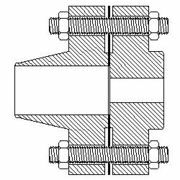 These flanges normally come in blind, slip-on, threaded and weld neck flanges. They are available in all pressure classes and provide a good alternative to connecting two different sizes of pipe. This type of flange should not be used if an abrupt transition would create unwanted turbulence, such as at a pump.